The tooltip with information about the product can be found in the Data and Assortment tab when you point the mouse cursor on the icon to the left of the collected product or product of your range. Now you do not need to open multiple columns to view detailed product information. Also, additional information about the product (volume, weight, composition, etc.) is displayed in the screen, if there is such information. 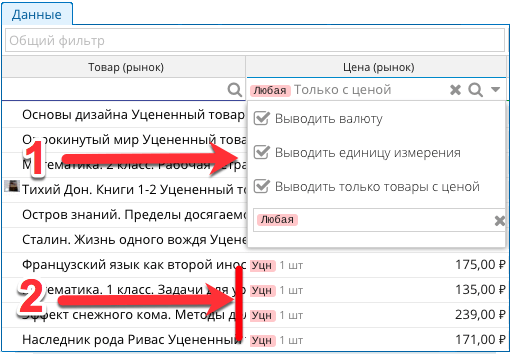 Now, search operators are used in the Data and Assortment tabs, when searching in the Product columns, which make it possible to refine the search query and the presence of the requested words in the output results. 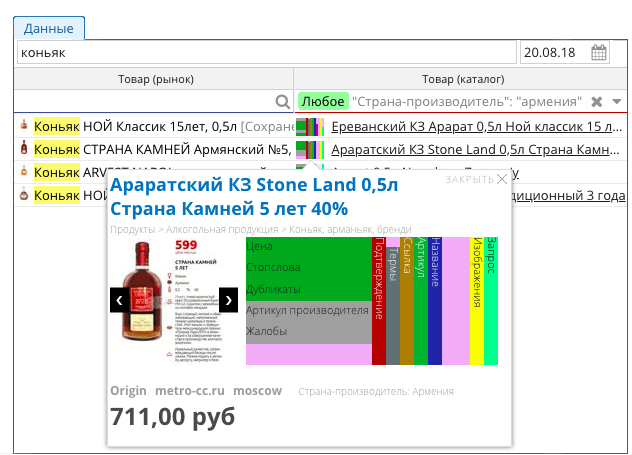 Search for products containing the query words in the specified sequence and form. “Sony Play Station 4” will be found. — Search for products that do not include a specified word or expression. Only a word or expression in quotes preceded by an operator is excluded. | Search for products that include any word or expression in quotes from the query. The markdown label (if any) can be indicated in the table (item 2 in the screenshot) from the left edge of the cell. Now, monitoring products in different markets, you can quickly identify in what currency the price is represented, as well as the quantity of the products sold in several pieces per package. The filter of price availability will allow you to hide products with no price stated, and markdown will allow you to identify the presence of any markdown, which will simplify and speed up the work with the interface.